JH: Back in the day when science fiction first became a thing, those writing it were mostly scientists. Since then, science fiction has expanded to include scientists and non-scientists alike, but the love of science has remained the same. Please help me welcome Lesley L. Smith to the lecture hall today to share her thoughts on science and science fiction. Lesley L. Smith has a Ph.D. in Physics and an M.F.A. in Creative Writing. She's authored or co-authored scientific articles in the Physical Review, Modern Physics Letters, Astrophysical Journal and elsewhere. Her science fiction novels include The Quantum Cop, Kat Cubed, and Temporal Dreams. When I was a girl my dad introduced me to this thing called science fiction. I was immediately hooked by the smart people, strange creatures, foreign worlds and fabulous adventures. For example, when fourteen-year-old Arkady Darell stows away on a spaceship and discovers the secret location of the Second Foundation, I thought it was awesome! Who wouldn't want to fly around the universe and have exciting experiences? For me, science fiction was a gateway to science. Reading about other planets, stars and galaxies in stories led to reading about real planets, stars and galaxies. Cut to, ahem, several, years later and I'm a Ph.D. physicist--and a science fiction author. 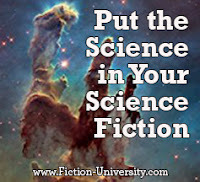 Science and science fiction have many things in common. Chief among these commonalities are they both call for intelligence, curiosity, imagination and creativity. Questions abound. What's happening? Why does this happen? How does this happen? What if...? What will happen in the future? In addition, science and science fiction both require hard work. As Einstein famously said, "Genius is 1% talent and 99% hard work." Both science and science fiction have tools of the trade. Reason and logic are the tools of science. The beauty of science is the processes for this hard work are pretty much laid out in the scientific method. I was just at a regional science fair and it was inspiring to see the young people asking questions, doing background research, constructing hypotheses, running tests, analyzing data and drawing conclusions. This method enables us to discover facts and to advance human knowledge. Let's pause and think about that for a moment: we can find the real objective truth via this method. That's pretty amazing. Science fiction also has its tools and processes, but they're rooted in the storytelling tradition. There's a famous aphorism: the most important rule of writing is there are no rules of writing. But this isn't quite true; there are certain elements of a story authors need to include. At its barest bones a story is: a protagonist has a problem, acts to solve that problem, and gets some result. All fiction follows this formulation. Science fiction, then, must add science to the traditional story formulation. Hence, often in science fiction we find protagonists that are scientists. In fact there are certain elements, which, if present, can classify a work as science fiction, no matter what else it contains. These can include new futuristic technologies such as robots and spaceships and the like, other planets, alien creatures, time travel. These common elements are primarily connected to plot. It should be noted that modern science fiction also needs to have fully-fleshed out characters and emotional components, in addition to a neat plot. I've taught a few science fiction workshops and at some point the question "What's the difference between science fiction and fantasy?" seems to come up. Or, sometimes, "How do I tell if what I've written is science fiction or fantasy?" The crucial delineation between science fiction and fantasy is: science fiction must be internally consistent and rational. This is because science fiction started during the industrial revolution when science and the scientific method were being perfected. Fantastic fiction started as a reaction against this. Thus, science fiction has its basis in reason and logic, while fantasy has its basis in irrationality. In my opinion, it's this combination of story, science, reason and imagination that makes the science fiction magic happen! Don't forget the imagination and creativity components. Without them you may have a (very nice!) nonfiction science article. So, keeping this in mind, there are a few different ways to take your science fiction to the next level. You could invent new science or extrapolations of current science. You could combine different kinds of science in new and original ways. You could imagine new consequences of current, future, or imagined science. This last method might be the trickiest, but can be the most effective. Do whatever inspires you the most. It can be tough to keep up with scientific advancements. But, don't worry! There are a lot of resources out there, including blogs and traditional periodicals. One of my favorites is Science News for short relatively easy to understand articles. The popular science magazines, such as Scientific American and Discover, do great year-end summaries of the most important discoveries of the year. In terms of blogs Sabine Hossenfelder's BackReAction, Joe Hanson's It's Okay to be Smart, Bill Nye's Planetary Society Blog are among my favorites. In this day and age do be careful about your information sources; not all information is reliable. For my part, I've been fascinated with the consequences of quantum mechanics. My physics dissertation was on quarks (the tiny particles that make up neutrons and protons) and I discovered some bizarre things in graduate school. There's some beautiful and very effective math at the heart of quantum field theory, but it leads to infinities. I don't know about you, but in the real world, I rarely experience infinities. A group of quantum mechanical 'interpretations' were created to deal with these infinities. For instance, the Many Worlds Interpretation says there are an infinity of worlds, but since human beings can only experience one world, they only experience one. Probably the most famous interpretation is the Copenhagen Interpretation, which states an observation of the infinities collapses them down to one instantiation. The famous Schrodinger's Cat Experiment is an example of this interpretation. Freaky! My imagination is definitely fired up. 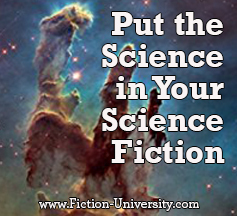 Whatever type of science fires your imagination consider putting it in your writing! Use all the tools at your disposal to create great stories. Because, who knows? Some little boy or girl somewhere might pick up your work and be inspired him- or herself! Let's hope so. When interstellar singer spy Jack Jones has to solve his own murder on The Shakespeare things do not go smoothly. First his clone body loses thirty years of memories, and then it starts experiencing strange urges and abilities. As he investigates he discovers brigands, space pirates and a secret faster-than-light drive, which could push the galaxy into war. He would sing a song, solve the mystery, and save the day--if only he could remember how. Fantasy isn't irrational. It just isn't science based. Building an authentic fantasy world, magic system, etc., requires logical thinking on the part of the author because the world, etc., have to make sense within the parameters the writer sets for the world.